The primary care physicians at our facilities offer the vaccine. Cold and flu season is here and getting a vaccine should be on the top of your to-do list. Get the facts about why. Every year, five to 20 percent of Americans are expected to get the flu (influenza). That’s a lot, especially since there is a flu vaccine that has a high chance of preventing it. Our medical experts bring you the lowdown on this year’s flu predictions and what you need to know to stay well. What is the flu and how is it different from the common cold? Expert Answer: The flu is very serious. It’s a major killer around the world. On the outside, it differs from a cold because of the severity of its symptoms – it leads to high fevers, body aches and respiratory symptoms. Something else that makes the flu really dangerous is while the immune system is busy fighting it off, other issues can sneak in. Many times, when you read about deaths from the flu, they are deaths resulting from bacterial pneumonia that starts after the flu, when your body is already weak. How do I know if I have the flu or a cold? Expert Answer: Initially when the flu starts it can seem like a cold – a runny nose and all over “yucky” feeling. But, within a couple of days, it can become a lot worse and bring muscle pains, a spike in fever and coughing. Children (and some adults) with the flu may also have nausea, vomiting and diarrhea. Use your best judgement and get to the doctor as soon as possible if you suspect you have the flu. What should I do if I think I have the flu? Expert Answer: See your doctor as soon as possible, especially if you have been around someone with the flu. If you are going to get medication, it needs to be earlier rather than later for it to work properly. Other than that, rest and stay hydrated until it runs its course. If you can’t keep fluids down and feel dehydrated, seek immediate medical care. How can I protect myself from the flu? Expert Answer: Get the flu vaccine every year. Use other common-sense preventive measures like washing your hands, covering your mouth when you cough and keeping kids home from school if they aren’t feeling well. Expert Answer: According to the Centers for Disease Control and Prevention (CDC), the vaccine may reduce the risk of flu illness by 50-60 percent. Most years, the strains that are going around are the ones included in the flu vaccine. But, occasionally, the vaccine is less effective. But even when this happens, the vaccine still provides partial protection and could reduce the severity of the illness. Is the vaccine only in the form of a shot? 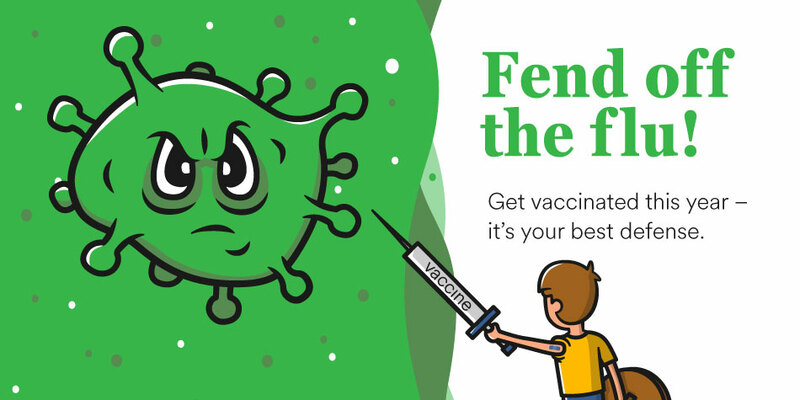 Expert Answer: The flu shot is the most effective way to prevent the flu, but there is a nasal spray made of attenuated (weakened) live flu viruses. In the past, pediatricians have used it for children, however, due to data showing an ineffectiveness of the nasal spray, the CDC has recommended not using the nasal spray during the 2016-2017 flu season. Can you get the flu from the flu vaccine? Expert Answer: Absolutely not. If you’re feeling cruddy the next day, yes, that is probably a result of the flu vaccine, but that will be about the extent of it. When is the best time of year to get the flu vaccine? Expert Answer: As soon as it becomes available – usually by the end of August or the beginning of September – before the cold and flu season starts. Usually, the vaccine takes a couple of weeks to become effective.